Please visit the Verify Certificate page and enter in the Certificate Number. 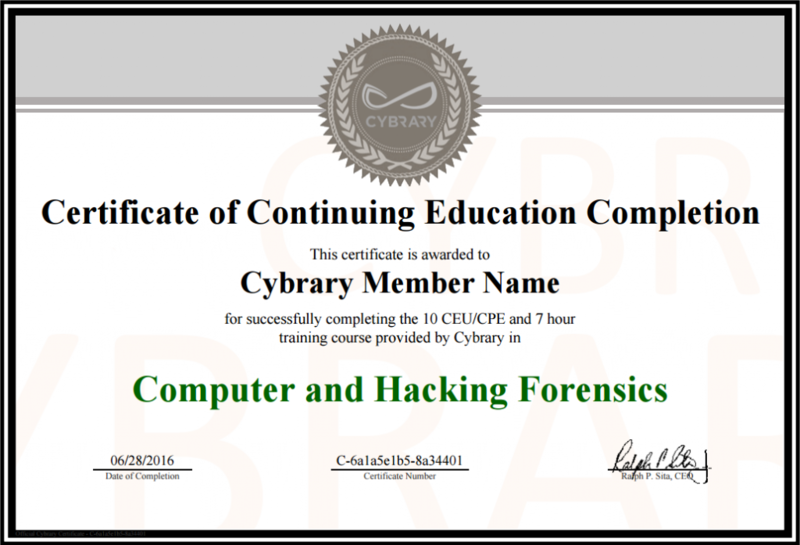 Help Support Cybrary and Purchase Your Certificate of Completion. Continuing Education Units and Continuing Professional Education units are measures of continued learning that are required by some authorizing certification organizations. The authorizing organization may require a certification holder to meet a certain number of units within a given period of time, in order to maintain a certification’s validity. For example, CompTIA requires CEU’s in order to maintain their certifications. Most authorizing certification organizations maintain their own internal approval process for the acceptance of credits. Typically, a certificate of completion which includes clock hours and completion date, are required in order to apply for the CEU / CPE credits. IMPORTANT NOTICE: The acceptance of CEU / CPE credits through completion of training on Cybrary is solely the decision of the authorizing certification body.